"Before I got too old I had to do something I love, and I love darts," Jensen said. He's played darts recreationally and competitively for twenty-two years and now hopes to have a destination for other local darts enthusiasts like himself. Jensen opened Trips Darts at 822 Madison Avenue in Covington in December. "Five of the top ten darters in the United States live within fifty miles of here," Jensen said. "So, this is a hotbed for darts." 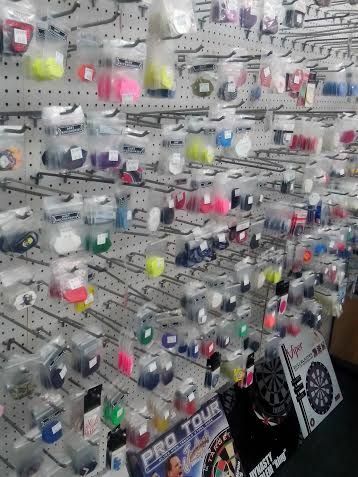 Trips offers custom-made darts and all the necessary retail accessories and will also host leagues and tournaments. Jensen started making darts a year ago in his Verona home and now has his machine in the back of the new shop. When the time came to find such a place to operate his new business, he chose Covington because of, "location, location, location". "This is five to ten minutes from a whole lot," he said. "Covington is a great place to do business." The name Trips is a reference to the metal rings that surround the various scoring spots on a dart board but the more skilled players who have already made the new spot a regular stop know that. The highest possible score a darter can achieve in the throwing of three darts is 180 and players who reach that mark get to sign their names to the "180 Wall". Already, there are several. But you don't have to be a budding darts all-star to stop in and throw. If you bring your own darts, Jensen will let you throw free of charge at the stations he's set up. If you don't have your own darts, he'll gladly sell you a set. Electronic dart boards are also available for your playing pleasure but those do have a price attached, not set by Jensen. Right now games cost around a dollar. In fact, if you stop in early you might find Jensen tossing a few rounds with players from Hong Kong or other players around the globe as he waits for the customers to arrive. "I'm really happy I did this," Jensen said of opening a new business. "I used to be on the road driving a lot. Having an actual place to work is nice." Note: Trips Darts hosts a tournament this weekend, January 25 & 26. $40 entry fee + $5 administration fee. 30 players maximum. $500 for first place and the top 8 players will receive money. For further details, contact Trips Darts.